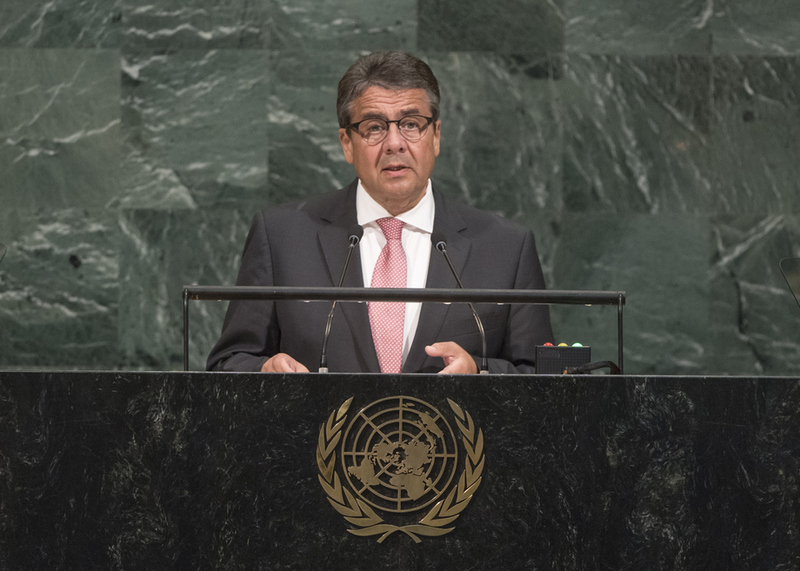 SIGMAR GABRIEL, Federal Minister for Foreign Affairs of Germany, said world leaders must question how to bring about change that would lead to more peace and stability, less hunger and better prospects for everyone. While humanity faced the same structural difficulties as it had some 40 years ago, it seemed more difficult to change the world for the better. A world view that placed one’s own national interests first, and was no longer engaged in balancing interests among countries, was gaining ground. That view described the world as a battle ground where everyone fought everyone else, asserting their own interests, either alone or in alliances of convenience. “I am convinced that we have to rise against this worldview,” he said, stressing the need for more international cooperation and less national egoism. The motto “our country first” not only led to more confrontations and less prosperity, but in the end, there would only be losers, he warned. After two world wars, he said Germany had learned to see its former enemies as neighbours and partners with whom it sought peaceful coexistence. In international cooperation, no one lost sovereignty. Turning former enemies into friends had been a difficult path for Germany, as the call for cooperation was not always popular in one’s own country. Yet, that effort had created peace in Europe after generations of war. Germans were grateful for the countries in Europe that had shown the courage to make his country — once an enemy — a new and lasting friend. The actions of Democratic People’s Republic of Korea illustrated the urgent need for the international community to signal its rejection of that country’s provocations. The way in which that crisis was handled was of grave importance, as it would influence how other countries viewed the attractiveness of building nuclear arsenals. The situation involving the Democratic People’s Republic of Korea was neither a bilateral, nor a regional problem, but rather, a global challenge to be collectively addressed. It was more important than ever that the international arms control architecture not be questioned or allowed to crumble. That included the Joint Comprehensive Plan of Action, which, if allowed to fail, would create repercussions far beyond the region. Were it to be scrapped, confidence in such agreements would surely decline. He drew attention to the escalating violence against the Rohingya, urging the international community to act as quickly as possible in terms of political engagement and humanitarian support to address that crisis. Germany was committed to providing support to many crises, and in recent years, had tripled its contributions to civilian peacekeeping. Progress had been made in Iraq, where success against the so-called Islamic State must now be consolidated by helping the victims return to their home countries and strengthening a democratic and inclusive State. The international community had to make progress in the Ukraine conflict, he said, calling on the Secretary-General to determine the viability of establishing a peacekeeping mission there. He went on to underscore the need for strong international institutions, particularly the United Nations, stressing that, while its principles were not outdated, it must adapt to current realties. The Secretary-General had set the right priorities in his reform agenda, he said, cautioning that such efforts should not focus primarily on cutbacks. As greater resources were needed, Germany would maintain its financial support and was ready to shoulder additional responsibility.